Our Becados (Scholarship) students are finishing the year empowered. Last month we listened to a presentation from Noel Flores regarding his internship at Southwick Zoo near Boston, MA. After an amazing presentation about Noel's adventures, we had our own adventure in the canopy of the rainforest. That's right! 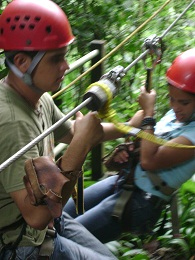 We flew like the Great Green Macaw through the canopy on a zipline. It was a great reward for our hard working students. This month, we are writing letters to our generous Sponsors who make education a reality for these 30 kids! This activity is always a challenge and a chance to practice English. I can't wait to help; it reminds me how much the kids appreciate the opportunities afforded to them. Although we have a great group of 30, there are more students who need financial help to attend High School. Thank you sponsors for your gift of education.